Milton Cricket Club play in the village of Milton, just north of Cambridge. We are easily accessible with excellent facilities which include 2 grounds with pavilions, three outdoor nets, a bowling machine plus a professionally maintained 10 pitch square. 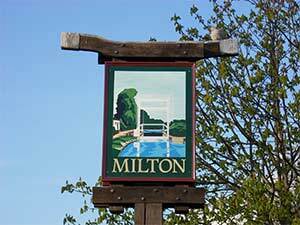 Milton is a village positioned just north of Cambridge, England and is close to the junction of the A14 and A10 roads. The Milton Cricket Club was originally believed to have been formed in 1911 and moved to The Sycamores recreation ground in 1990. The land for the pitch was given to the village by Tesco as part of the condition by the parish council for building a supermarket on an adjacent plot. This season (2018) the club is running 3 senior teams , and a midweek team, an AllStars programme for 5-8 year olds, and coaching sessions for 8+ year old children. The club’s facilities include 3 artificial pitch nets, a bowling machine, access to several qualified coaches, and a 3 colts and 7 senior pitch square. The club also have the use of the pavilion building on The Sycamores which includes 4 changing rooms with showers, kitchen facilities and entertaining areas. A new ground was established in 2017 at North Lodge Park with pavilion and artificial pitch. Milton Cricket Club is constantly looking out for new players at both Colts and senior ages. All levels are catered for; from very competitive cricketers who play in the Cambridgeshire leagues on Saturdays, right through to fun friendlies played on Sundays or mid-week. We are also looking for volunteers to help run the club. This can involve as little as 1 hour a month, cutting grass, writing reports for the web site, organising teams or even making the teas. Milton Cricket Club is a historic cricket club, dating back to 1911, based in the desirable village of Milton, Cambridge.